HeLa cells were subjected to SDS PAGE followed by western blot with 17914-1-AP (MDMX antibody) at dilution of 1:300. MDM4 is also named as MDMX. It inhibits the activity of the tumor suppressor p53 by primarily cooperating with the p53 feedback regulator MDM2. MDM4 resides mostly in the cytoplasm, but can be recruited to the nucleus by MDM2.(PMID:16511572). The predicted mass of the protein is 54 kD, while the observed mass is 80 kD, a difference which stated is probably due to phosphorylation or other posttranslational modification(PMID:9226370). It can be ubiquitinated and degraded by MDM2(PMID:16163388). It has 5 isoforms produced by alternative splicing. 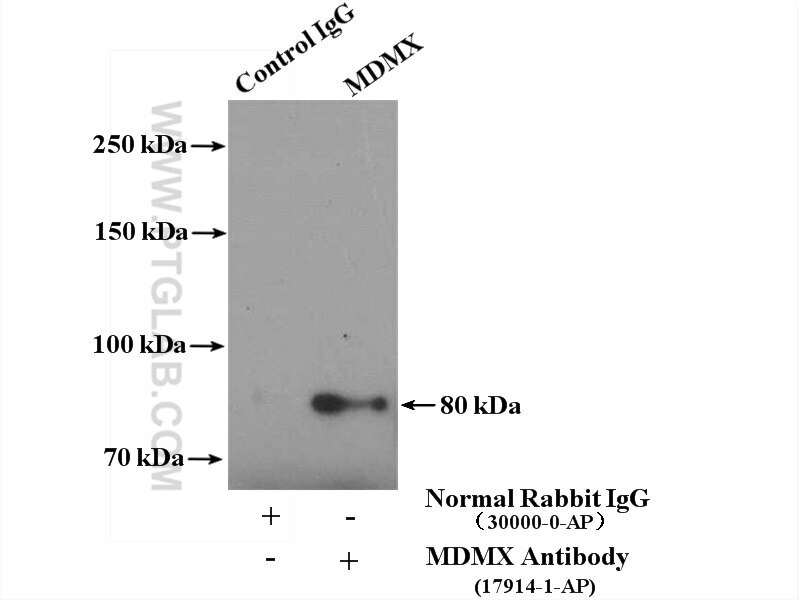 Context-dependent roles of MDMX (MDM4) and MDM2 in breast cancer proliferation and circulating tumor cells. MiR-1205 functions as a tumor suppressor by disconnecting the synergy between KRAS and MDM4/E2F1 in non-small cell lung cancer. FL118 Induces p53-Dependent Senescence in Colorectal Cancer Cells by Promoting Degradation of MdmX. Targeting RING domains of Mdm2-MdmX E3 complex activates apoptotic arm of the p53 pathway in leukemia/lymphoma cells. Reversal of cisplatin resistance in non-small cell lung cancer stem cells by Taxus chinensis var. Mdm2 Splice isoforms regulate the p53/Mdm2/Mdm4 regulatory circuit via RING domain-mediated ubiquitination of p53 and Mdm4.